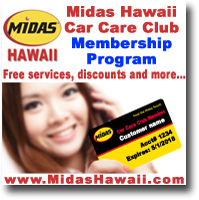 MidasHawaii.com wants you to experience great customer service from start to end. One of the ways we achieve this is by listing prices and selling many of our popular auto repair services online (oil change, tire rotation, etc.). Shop Smart - This allows you truly be an educated shopper and control your cost. We win only when you win. All our online "Products/Services" includes our standard shop fees! You save more money. We use safe and secure PayPal® for all our online transactions. Our testimonials speak for themselves...check them out here. We think that our features, functionality, reliability and value should be evident within a few clicks and that prospective customers should be able to purchase popular auto repair items online with no surprises. We know that this not normal and in industry, but we believe that most of our customers appreciate being able to control their cost before coming into our shop. 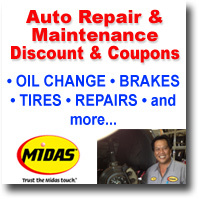 The treasure hunting for popular auto repair services can be time consuming and annoying to get the facts. We hope you use our online shopping cart to not only save money but also manage your cost!